Since trying a variety of products that are gluten free and sold in super markets I have been inspired more to bake cookies, breads and all sorts of goodies. However, as I explained to you in my last post It is very expensive to bake and or buy Gluten Free Products . After having such a great success with the Oat flour I decided to make you a great new recipe. 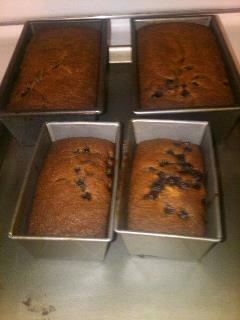 Now on to my Recipe for Blueberry Banana Bread made with Home Made Oat Flour. Add eggs and vanilla and melted butter and beat again. BBQ Deviled eggs with Bacon.